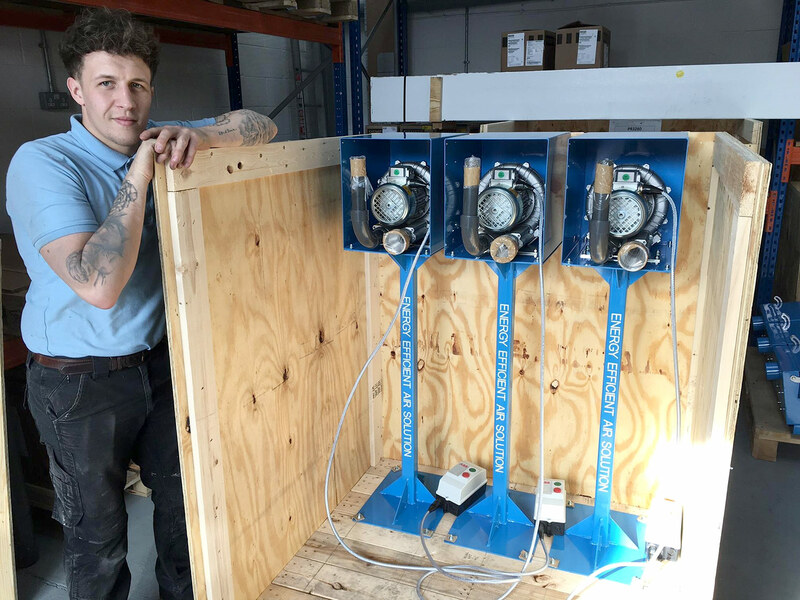 We are pleased to announce that our production engineer Matt Davies has just completed the installation of a new, bespoke blow-off system for ceramic tile manufacturing. This exciting new energy efficient system replaces Air Nozzles and so reduces immediately energy costs so the client sees a quick return on their investment. With the new system each .55kW blower is connected to a 150mm long High Impact Air Knife. These are used to blow dust and debris off the tiles during the manufacturing process and the Air Knife is positioned within custom designed enclosure which is connected to a dust extraction system. This means that the system deals with the whole process with high efficiency. This is one of a number of bespoke systems that we have designed for clients. If you would like to discuss this system or any aspect of Air Knife Systems in general please do not hesitate to contact us, we are happy to chat!